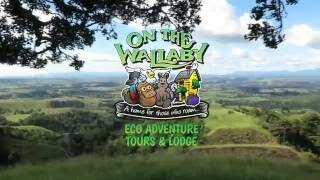 “A home for those who roam” On the Wallaby Eco Lodge is the perfect base to explore the beautiful Lakes, Waterfalls and Rainforest of the Atherton Tablelands (1hr from Cairns). From the lodge you can stroll down and spot Platypus and enjoy a delicious nightly barbecue dinner. Head out on a Night Wildlife Canoeing Tour or hire a mountain bike or canoe. Soak up the relaxed laid back atmosphere and lovely gardens. Eco Certified and perfect for Educational Groups! Tailor made tours for groups are also available. The four, six and eight share dormitory rooms are clean and very comfortable. Linen is supplied free of charge. The Single/ Double or Twin rooms are clean and very comfortable. Linen is supplied free of charge. Guests have a choice of share accommodation, double rooms or camping sites. Guided day / night canoeing and mountain bike tours are also available.